Giving children props to support imaginative play and develop storytelling boosts confidence and extends their play. This lovely wooden theatre gives children, who may be too shy to normally play at performing, an incentive to try, and they can buy the finger puppets to go with it or have a go at making their own! The portable carry case makes it a great product for taking on visits to prevent children getting bored. It also packs away for easy storage with room for the puppets inside. A Wooden theatre that's ready to go where you go! Open up the wooden Carry-Case Theatre and quickly slot the parts together to make a finger puppet theatre, making a wonderful alternative to the usual screen-based entertainment. With bright paints and charming details, the Carry-Case Theatre will add colour and fun to any playroom or classroom. It features satin top curtains and gold-trimmed velour side curtains that can be pulled open for dramatic effect. There is even a mini-chalkboard to announce show times or the title of the latest blockbuster! It easily folds down for storage or transport and there is spare room inside the box to store puppets too so very handy if your puppet show goes on tour! The Carry-Case Theatre perfectly complements Fiesta Crafts's range of wooden-headed finger puppets available individually or in story sets. Sets include Red Riding Hood, Alice in Wonderland, Goldilocks and the 3 Bears and many others. From a parent's or teacher's perspective finger puppets are fabulous for a child's development. 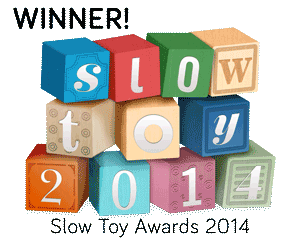 Puppets encourages children to be creative, imaginative and communicative in ways very few other toys could achieve. With the Carry-case Theatre children will want to put on a show which will help them improve their speech and language skills and boost their confidence no end. Giving children props to support imaginative play and develop storytelling boosts confidence and extends their play. 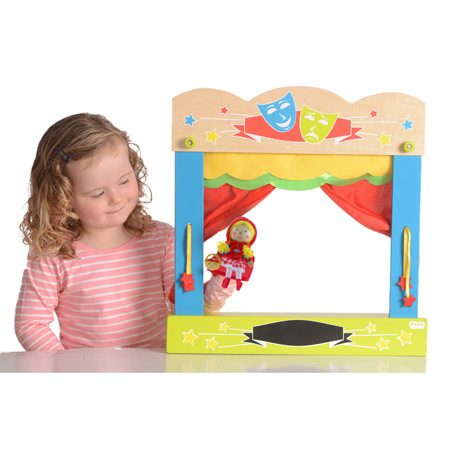 This lovely wooden theatre gives children, who may be too shy to normally play at performing, an incentive to try, and they can buy the finger puppets to go with it or have a go at making their own!